I love the fabric and the paper pinwheels that Erin used on her Halloween wreath last year. And I love the fun 'welcome' garland that she hung in the middle of the wreath. It looks like a little charm bracelet. 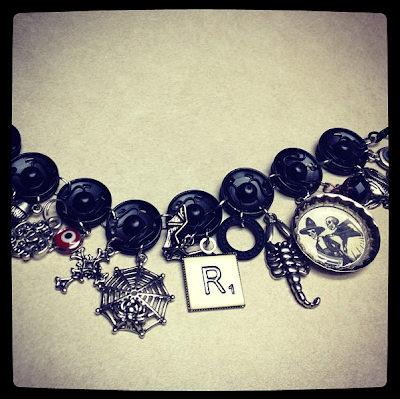 Which gives me a really good idea on what to do with the leftover charms from my Halloween charm necklace. You can check out Erin's welcome Halloween wreath and the rest of her Halloween decorations over at Kaminski's Creations. Thanks for sharing my wreath! And thanks for hosting!